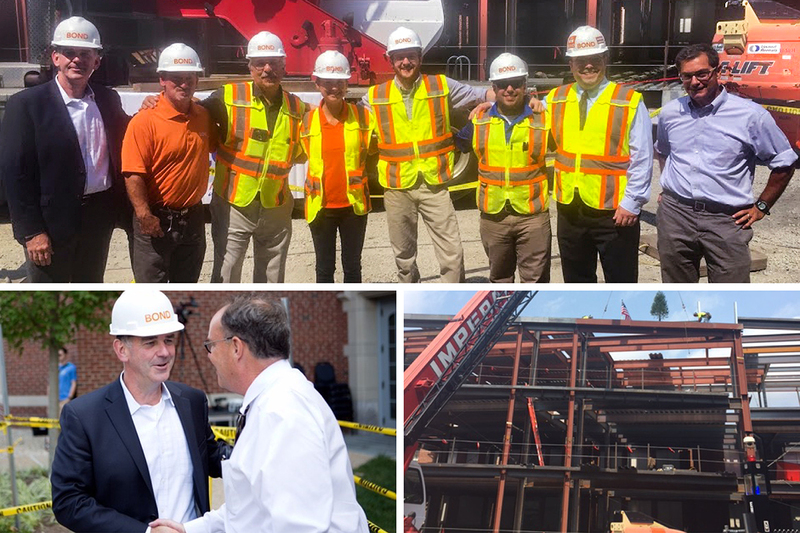 (Providence, RI) – BOND, the Northeast’s premier building, civil, utility and energy construction firm, celebrated the topping off of the Providence College Science Complex. The ceremony marked the last steel beam raised on the newly revitalized facility, designed by S/L/A/M Collaborative. It was attended by the Providence College community, the BOND project team and design partners. The multi-phased, science complex project will unite three buildings: Albertus Magnus Hall, Hickey Hall and Sowa Hall. A new 37,000-square-foot, four-story addition will serve as the new main entrance. Renovations to approximately 80,000 square feet of existing space include: modernized laboratory space, technology-rich classrooms, a roof-top observatory that doubles as an outdoor classroom, a computer modeling and computational lab, microscopy suite, administrative suite, outdoor greenhouse and a new student commons. The project is on-track, within-budget and slated for completion June 2018.